One man was taken to hospital following the smash in Cumbernauld. Celtic players Olivier Ntcham and Odsonne Edouard have been involved in a road crash that left one man in hospital. The two-vehicle smash happened in Cumbernauld around 2.20pm on Wednesday. Police said a blue Range Rover was driving north along Mollins Road when it collided with a silver Volvo at the junction with Orchardton Road. Emergency services were called to the scene and the road was closed for a short period. The 54-year-old Volvo driver was taken to hospital in Larbert following the crash. His condition is not thought to be serious. STV understands Hoops striker Moussa Dembele was also at the scene of the crash. Constable Stuart Newall said: "We are appealing for anyone who in the area who may have dash cam footage that can help us in our enquiries. "Did you witness the collision, or were you driving along that road prior to the collision? You may have information that can help us." Anyone with information is asked to contact Cumbernauld Police Office on 101. A spokeswoman from the Scottish Ambulance Service confirmed they had attended at two-vehicle collision with one person taken to hospital. She said: "We received a call at 2.11pm on Wednesday, July 11 to attend a road traffic collision on Mollins Road at the junction with Orchardson Road in Cumbernauld. "One patient was taken to the Forth Valley Royal Infirmary." 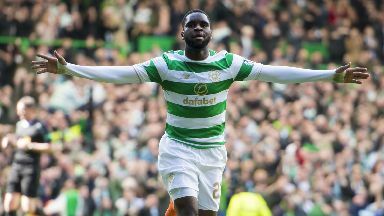 Edouard recently signed for the hoops from French side Paris St-Germain in what Celtic described as their biggest transfer in history. The Frenchman signed a four-year contract worth more than £9 million after scoring 11 goals in 29 appearances while on loan from PSG last term.